Have you ever compared your spouse to an animated character? I have. On more than one occasion, I’ve likened my husband Ted to the Grinch. Yes, as in the green recluse who lives on Mount Crumpit with the heart three sizes too small. It’s a good thing this man of mine has a sense of humor. While my husband certainly isn’t lacking in the ability to laugh at himself, what he is wanting in is holiday cheer. At least the kind that fuels excited participation. When it comes to tree trimming and Christmas cookie making, he just doesn’t care all that much – and it shows. Maybe you can’t relate. 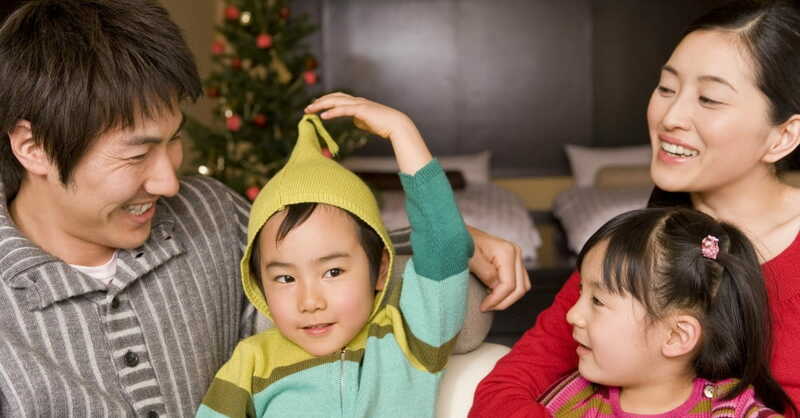 Perhaps your spouse has holiday cheer in equal measures to you. It could even be that you’re married to a Buddy the Elf. Yet whether you’re hoping your spouse’s heart will increase by three sizes or singing loud for all to hear, I think we can agree that either way, parenting as a united team during the holiday has its challenges. For example? Well, there’s determining which of your traditions to adopt, or deciding where to spend Christmas or New Year’s. Maybe even how much money to spend on gifts for your kids or what gifts to even buy them. So how can you and your spouse work together to create a memorable and enjoyable holiday season for your entire family? By practicing these three traits. A strong, united team is made of up members who support each other. As parenting partners, we can support each other by deciding not to fight about whose long-held tradition is better or even best, but rather to find ways to compromise. One of the ways we practice this at our house is in how we do Christmas morning. While Ted may lack cheer, there are a few traditions from his childhood that he does care about. He fondly remembers the magical feeling of discovering an unorganized sea of small wrapped packages. So, even though I’m a Type-A, “let’s carefully stage presents into neat little piles” kind of person, I compromise. I still cling to paper-coordinating which presents belong to whom, but we chaotically mix them up rather than carefully sort them out. What does support look like at your house? How can you and your spouse practice it during the holidays? In my book, Team Us: Marriage Together, I talk about learning to appreciate the ways Ted parents differently than I do. This can translate to holidays too. While I’ve learned to compromise when it comes to how we do Christmas morning, Ted’s come to better appreciate how organized I am. Because he’s more akin to the Grinch than to Santa’s tallest elf, he approaches holidays with less intention. With time, though, he’s realized the holiday season can be more meaningful if we put some advance thought into it. So while he may not jump at the opportunity to make lists with me, he does appreciate that I take the time to plan. How about you? Is there a quality your spouse brings to the holidays that you can better appreciate this year? Most importantly, as couples on this parenting journey together, we can stop trying to change the way each other person parents. Instead, we can choose to celebrate the unique qualities we individually bring to our family. As a planner, I have the tendency to rush through the “now” in order to get to the “later,” even when it comes to anticipated holiday events. Ted, on the other hand, is wonderful at embracing the moment (perhaps because he hasn’t been planning and isn’t being schedule-oriented). And that makes the moments I’ve helped plan all the more fun. I’m learning to celebrate that quality because, the truth is, our family needs it just as much as we sometimes need my organizational skills. What about your spouse? Are there one or two qualities you can celebrate about the way your spouse parents? When it comes to teaming up to create a memorable and enjoyable holiday season for our kids, it’s really not that hard. All it takes is a little support, appreciation, and celebration. And if my green recluse and I can do it, and have fun in the process, then anyone can. Ashleigh Slater is the author of the book, Team Us: Marriage Together (Moody Publishers, June 2014). With twenty years of writing experience, she loves to unite the power of a good story with practical application to encourage others. Ashleigh and her family reside in Atlanta, Georgia. To learn more, visit AshleighSlater.com.